*Disclaimer: I received this wine as a sample for a live tasting. I’m working on my 2nd set of 100 grapes, still. The second 100 is taking much longer than the first 100. After 4 years I think I’m approximately 40 grapes into the second hundred. To be honest, I haven’t made a huge push to find new grapes during that time. This bottle came to me, so that always makes things easier. 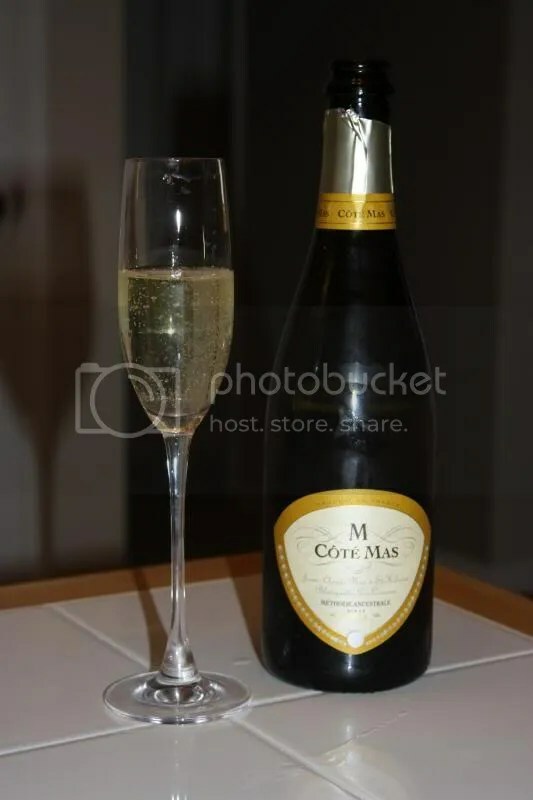 The wine is the Côté Mas St. Hilaire Blanquette de Limoux Méthode Ancestrale NV, which retails for around $14, has a traditional closure, clocks in at 7.5% alcohol by volume, and is made of 100% Mauzac grapes. 1.) The nose on this wine did not match up with what I tasted on the palate. Sort of like when you pick a chocolate out of the box thinking it’s caramel and it turns out to be marzipan. 2.) I think maybe the wine needed some food. Particularly something spicy. 3.) My thought on Mauzac is that it is a very unique grape and the resultant wine is quite surprisingly sweet. 4.) While it’s not something I’d like to drink on the regular, I’m glad I got to try the Mauzac grape. My goal for the posts about bubbles was to have them up before New Year’s Eve. However, I got taken down by a bronchial infection that I’m really just starting to kick now. Pardon my unexcused absence around here! 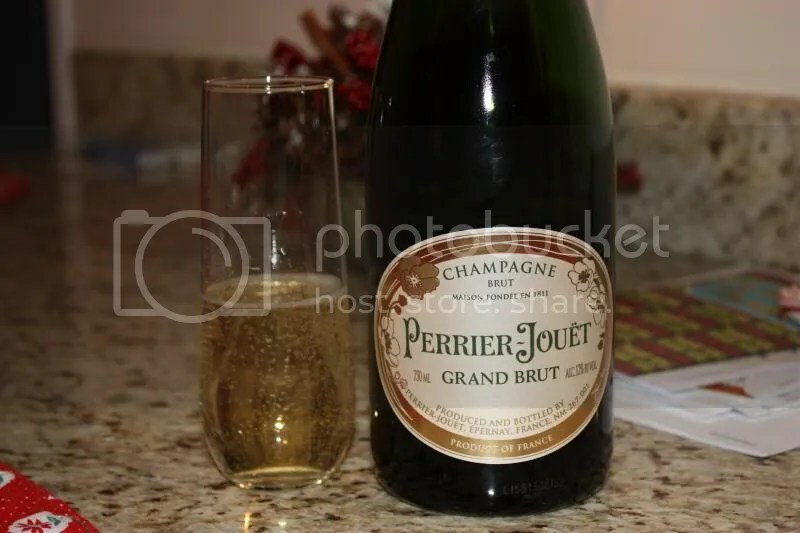 I think many people drink Champagne for Valentine’s Day, so consider me early with a recommendation for that “holiday.” I received several bottles of bubbles from a PR firm, and this was above and away my favorite. 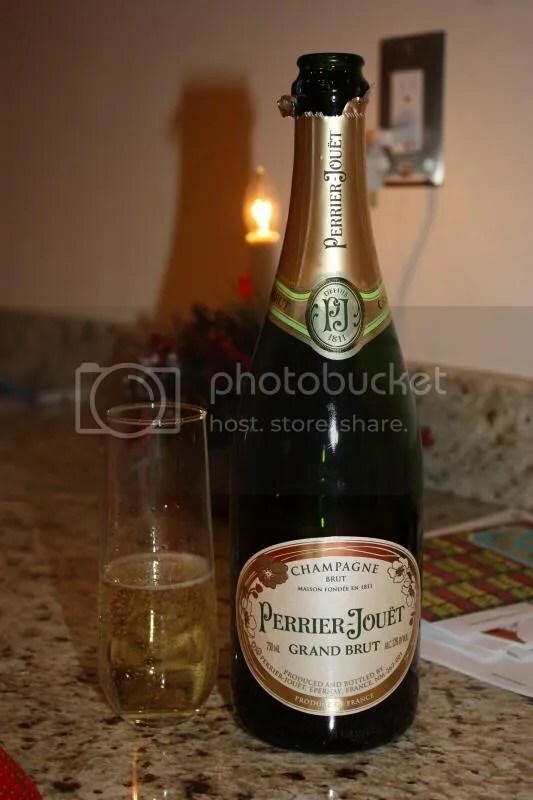 The Perrier Jouet Grand Brut has a Champagne closure, clocks in at 12% alcohol by volume, and looks to retail for around $40 from various online retailers. 1.) We tried four sparkling wines over the course of a few days, and this one got top marks from the whole family. 2.) The wine had an intriguing ginger candy note. 3.) I used my new air popcorn popper and popped up some fresh popcorn to go with this wine. Slightly cliched as a pairing, but really a nice salty match. 4.) 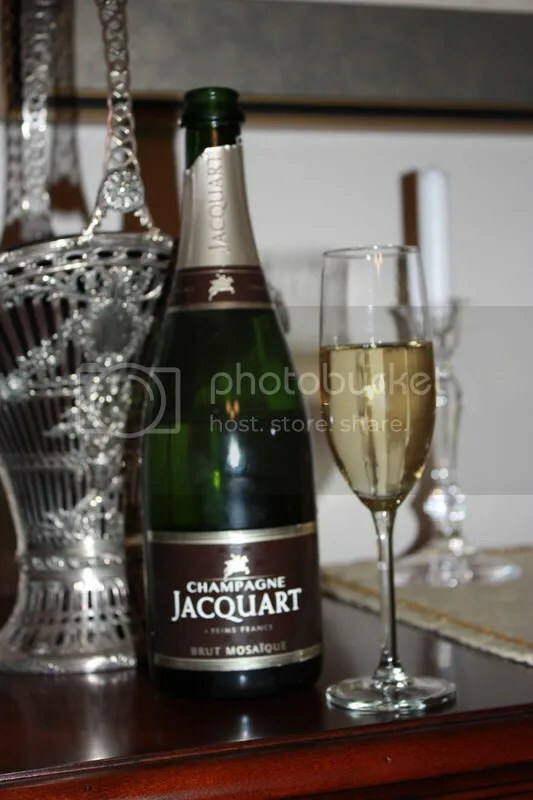 $40 for a tasty well-done Champagne seems like a pretty good deal to me for a special event wine. On the nose I got lemon, grapefruit, toast, and apple. I could almost smell the acidity that I could tell was coming on the palate. In the mouth I got spice, lemon, grapefruit, a honey note, and ginger candy. 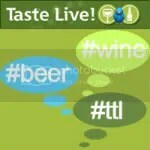 The palate had a lot going on and kept me coming back for more as I mulled over what I was tasting. What wine goes with a furlough? *Disclaimer: I received this wine as a sample from the importer, F. Wildman and Sons. Especially a furlough happening in 80+ degree October? Something cheap and cheerful, cheap being the most operative word in that sentence. I’m on my fourth day of furlough and thought I’d dig around for something that isn’t a budget buster and is a pretty tasty quaffer as well. No need to resort to drinking swill when there are plenty of bargains to be had out there in the sub $10 range. 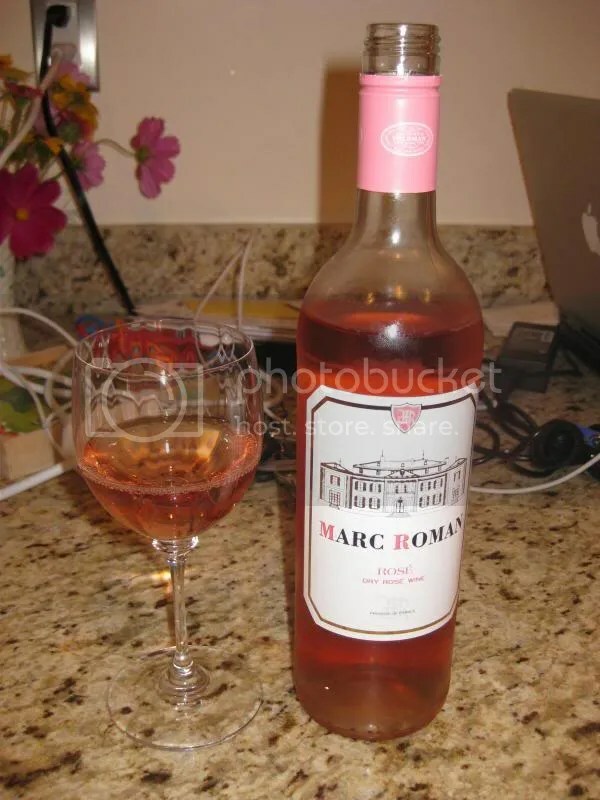 Today I chose the 2012 Marc Roman Rose. It’s a rose of Syrah, has a screw cap closure, clocks in at 13% alcohol by volume, and is on sale online for only $7.99. 1.) For the same price (or even a little less depending on your market) as a critter wine, you can instead have this delicate and interesting rose. Get this. 2.) In general, looking for wines with an F. Wildman import label has served me fairly well. I love their selections overall and they seem to do a pretty decent job with QPR. 3.) Rose, which I tend to drink in spades in the summer months, also makes an excellent foil for the upcoming heavier holiday foods season. 4.) My photos definitely don’t capture it, but the rose in the bottle has the prettiest pale pink color. On the nose of the wine I found raspberry, cherry, white flowers, and apricot. The wine had a really floral and delicate nose. In the mouth I got cherry, raspberry, and lime. I took two notes about the acid on the palate, which evidently, I thought was well done. It’s really the acidity on rose that holds it together for me, minus that you end up with an often cloying, flabby wine….which I’ve had my fair share of over the years. 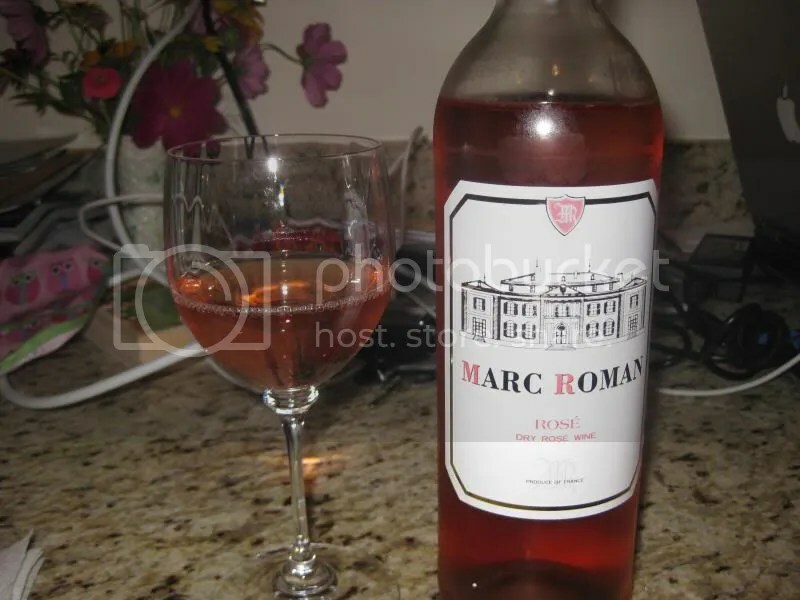 Put out the Marc Roman Rose with your stuffing and sweet potatoes and you’ll have a happy crowd. *Disclaimer: I received this wine as a sample for review. Many times I head down to my basement and stare at the wines. Then I reach my hand into a rack and play what I like to call “wine roulette.” Sometimes you wine, sometimes you lose. Tonight, I won the lottery twice with this wine and it’s partner. 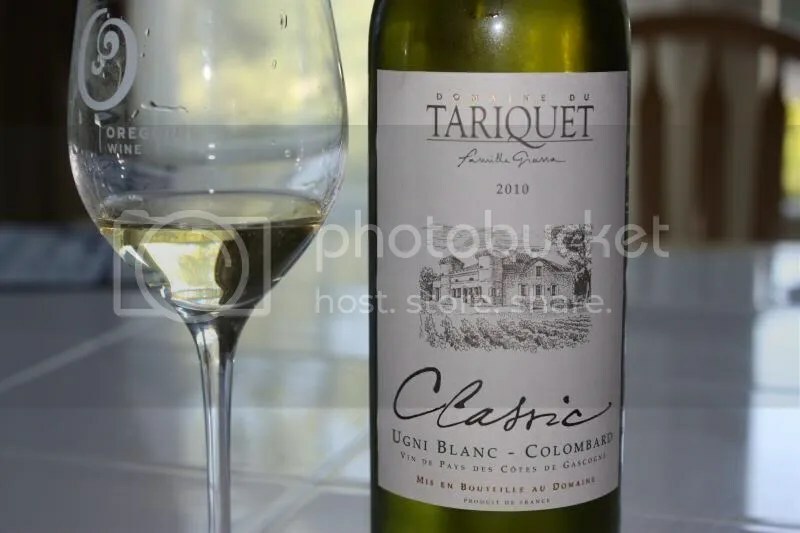 My winner for the evening is the 2010 Domaine du Tariquet Classic which has a screw cap, clocks in at 11% alcohol by volume, and retails for about $10-$11. The wine is a 70/30 blend of Ugni Blanc and Colombard. 1.) Generally, Ugni Blanc (aka Trebbiano) and Colombard aren’t the most, shall we say, distinctive wines on their own. 2.) Apparently, if you grow them well and blend them together, you actually get a light, fresh wine with great acidity. 3.) I shared this with our neighbors over some deep friend shrimp and they loved it. 4.) $10 is cheap and cheerful for an easy-drinking summer sipper. On the nose I got floral notes, lemon, spice, and lime zest. The wine smells fresh and I can almost taste the acid. In the mouth I found lime, tart apple, lots of citrus, and tropical notes on the finish. Overall, the wine is bright and crisp with good acidity and paired well with an end of the summer BBQ. The weather outside is frightful, but the fire is so delightful. 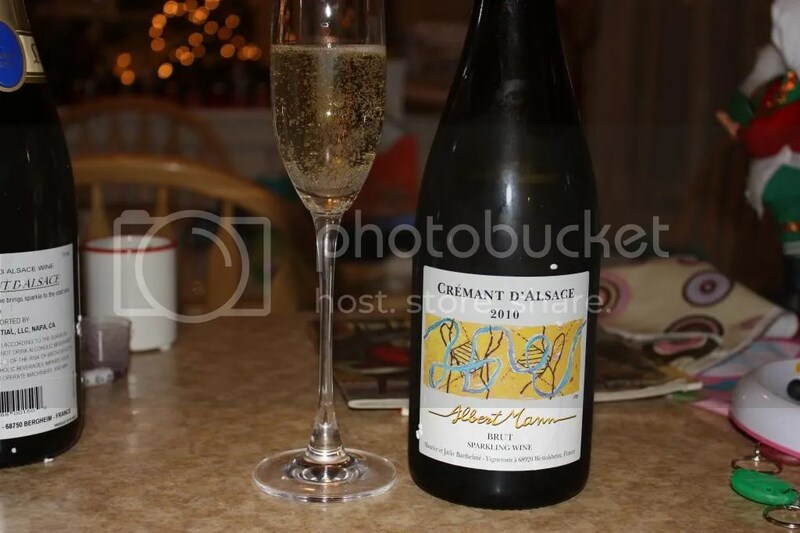 So if you’ve no place to go, let it snow, let it snow, and drink the 2010 Albert Mann Cremant d’Alsace. 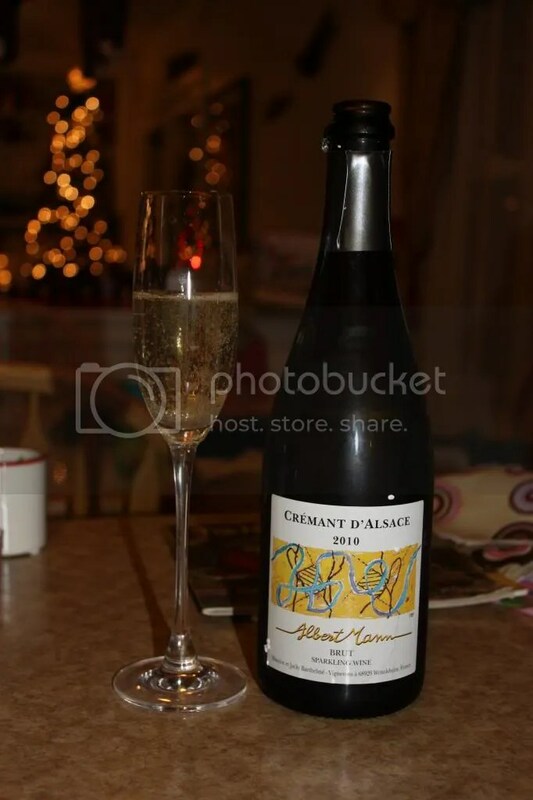 It’s a delightful sparkler from a not as internationally recognized and therefore way less expensive French region. 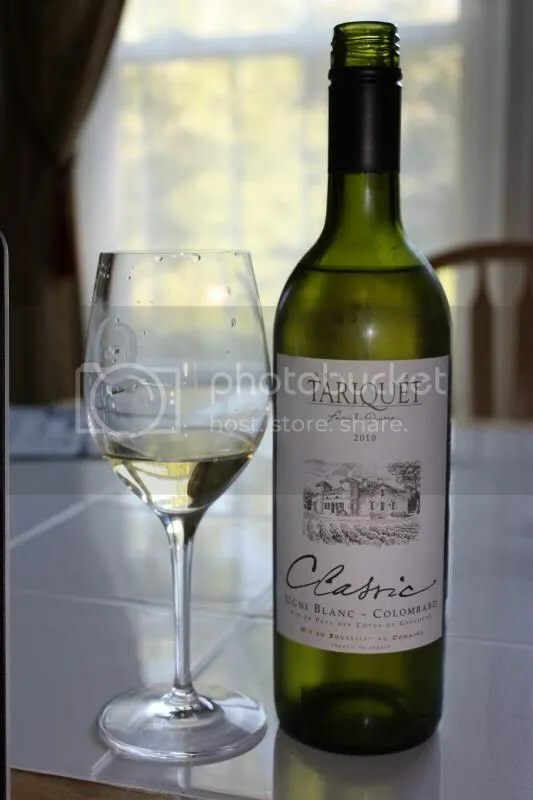 We chose it to pair with a rather heavy chicken casserole the other night, and the brightness of the wine helped cleanse and refresh the palate. The wine has a real cork closure, clocks in at 12.5% alcohol by volume, and retails for around $22. 1.) There is excellent value to be found in French sparklers outside of Champagne. 2.) At a retail of just around $22, the Albert Mann makes an excellent addition to your holiday parties. 3.) It’s vintage. Where else might you find a vintage sparkler for this price? 4.) Yes, I’m focusing quite a bit on price, but really, can you beat it? On the nose I found an herbal note, lemon, apple and pear. On the palate I first noticed all the bubbles. The wine had tons and tons of bubbles. In the mouth I got lemon, pear, salt, peaches, and a mineral streak. Overall I found the fruit to be tart and the wine to be refreshing, especially with the saline vein. Joy of joys, that time of year has returned where 4 pm on a Saturday rolls around and my thoughts turn to bubbly on the porch. In wine world, sipping bubbly on a perfect sunny afternoon outside is one of my favorite pleasures. 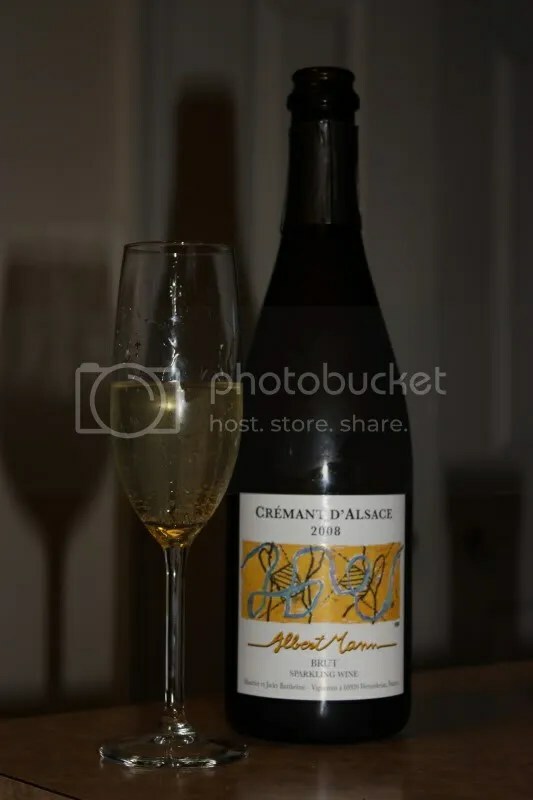 This Saturday we turned to the 2008 Albert Mann Cremant d’Alsace. 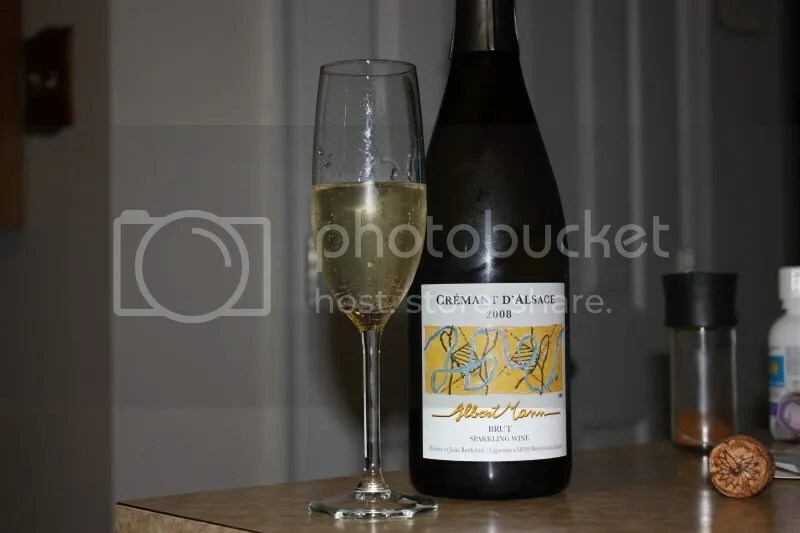 The Albert Mann retails for about $22, has a typical Champagne closure, and clocks in at 12.5% alcohol by volume. 1.) 105 degree weather + bubbles. Need I say more? 2.) At the price point it definitely doesn’t break the bank for an afternoon summer sipper. 3.) I was surprised by the red fruit notes on this wine. 4.) The nose was pretty simple. I was hoping for a bit more. On the nose I found white flowers, strawberries, and a waxy note. In the mouth I got raspberries, strawberries, biscuit, and a slight honeyish note. Overall I found the wine to be crisp and refreshing with excellent acidity.